Christmas wouldn't truly be Christmas without a cake and here is a Gluten Free Christmas Cake . Gluten free baking needn't be a daunting or terrifying affair , but with the right ingredients , it can be extremely satisfying . 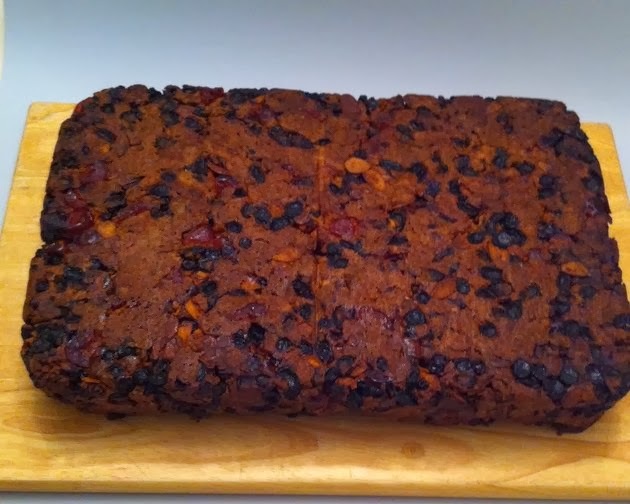 I actually prefer this Gluten free Christmas cake to the more conventional one and I can assure you that most people will find it difficult to tell the difference between this one and the regular one. Gluten is ordinarily a major factor in baking, as it holds the gases that are produced when the cakes rises and also provides an appealing texture.Hence ,this is where Xanthan Gum comes into play, it will bind,improve the texture,reduce crumbling by acting as a gluten replacement. 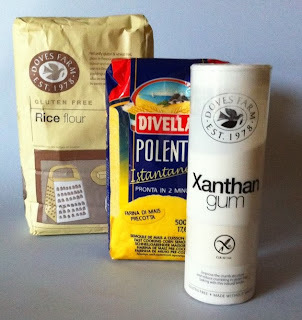 The other ingredients are Polenta , a gluten free grain , made from dried corn kernels. It has a slight sweet flavour which makes it perfect for cakes.Rice flour, made from a blend of brown & white rice,milled together to produce a creamy flour and finally Ground almonds for flavour and texture. The other beauty of this cake is , it doesn't require the lengthy baking time. This one is done in 1 hr 10 mins. This is why , it is one of my favourite . 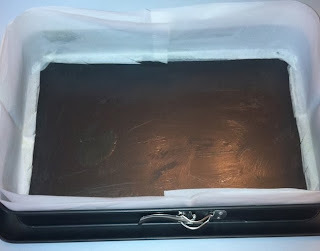 This recipe will do a 33 " round cake tin or as here a 9"x15" rectangular cake tin. Halve the quantity if you wish to make a smaller one. Mix all of the dry ingredients together and sift through a sieve . Mix all of the above in a large pan, place on med heat and bring to the boil. 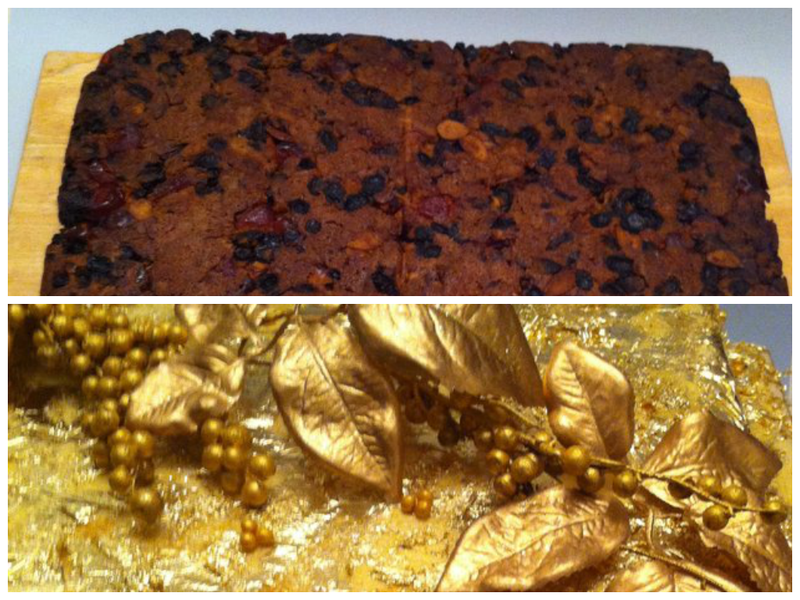 Set aside to cool for at least 1 hr, until the dried fruits have plumped up and soaked up all the liquid. 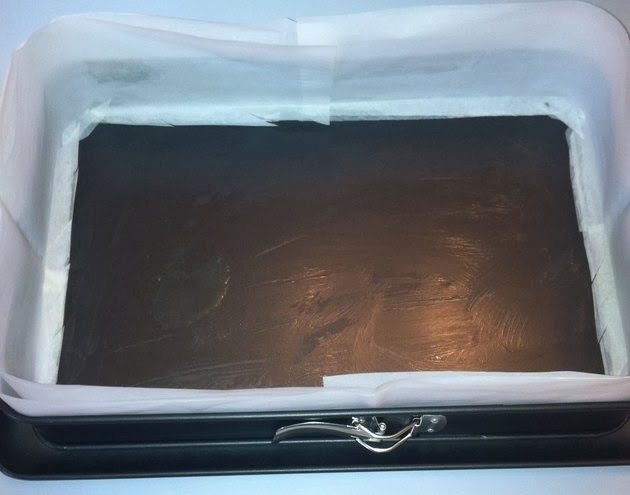 Double line your cake tin.Cut strips of grease proof paper ,wider than the depth of the tin , plus 1" extra and long enough to fit around the circumference. Fold 1 cm down along the edge of the strip and snip with scissors, at an angle and regular interval. This will help the paper to take the shape of your cake tin and create a lip at the bottom as well.Brush the tin with some melted butter, and smooth the grease proof paper inside it. Cut a base , the exact shape of your tin and fit it snugly inside . Do this twice. With an electric mixer, cream the butter and sugar until light and fluffy.Gradually add the eggs, alternating with a spoonful of the flour mixture to prevent it from curdling. Add the ground almonds, milk, flaked almonds and cherries. Mix well and add the fruit mix and finally the honey & treacle. Pour into your mould and bake for 1 hr & 10 mins or until a skewer inserted in the centre comes out clean. Immediately turn out onto your plate, top side down and allow to cool . This rich cake is packed with fruits and nuts and improves with time . Make it anytime from mid November to mid December. Soak the dried fruits & peel in the brandy overnight . Add the carrots, apples & nuts to the fruits mix . Cream the butter, sugar,& lemon zest until pale and fluffy. Gradually beat in the eggs , one at a time , Stir in the treacle and fold in the sifted flour, spices and soaked fruit mix . Double line a 10 “ round cake tin , tie a double thick band of brown paper round the outside of the tin . Spoon in the cake mix and level the surface, then make a slight hollow in the middle . Bake in a pre heated oven at 3000c for 3 – 3.5 hrs , or until a skewer comes out clean when inserted in the centre of the cake . Leave the cake to cool in the tin until cool enough to handle . When cool . spear some holes in the cake with a skewer and pour over some extra brandy . If you are not going to ice the cake soon, do feed the cake some extra brandy every now and then, to prevent it from drying out,and it will also improve the cake’s keeping properties and flavour . Wrap in grease proof paper & tinfoil and store in a cool dry place.